I have a new favorite winter pastime: Sitting in the sun. I’ve discovered that from about 9:15 in the morning until about 10 o’clock the sun, when it is out, shines on my spot on the couch. 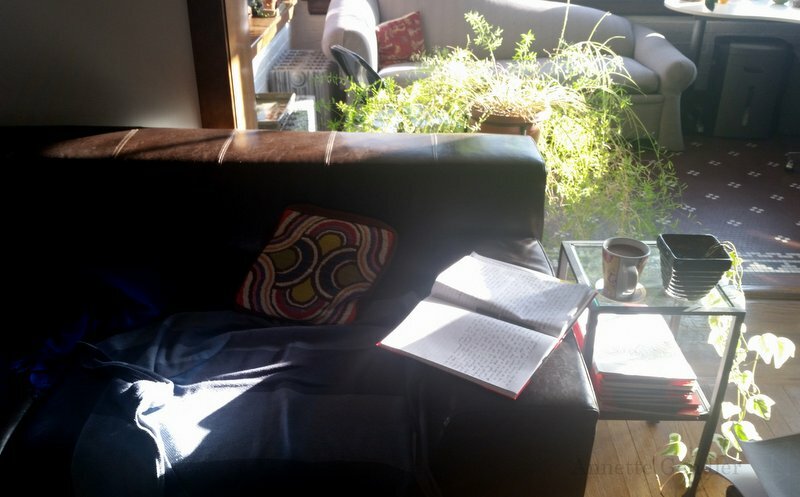 Initially I just noticed that I loved sitting there when the sun was warming my back, and the page I was writing on was bathed in sunlight, and a long shadow trailed my pen as it moved over the page. Then I started paying attention. When was this actually happening? Now, when the sun is out, I try to organize my day so that I can be in my spot on the couch by 9:15 a.m. to bask in the sun. It is utter luxury because many days, of course, I am not able to sit there at 9:15 a.m.; I’m at work or have other appointments. I’m going to watch now how this develops. I think this only happens in winter, and it only happens for a fairly short time in winter when the sun hangs low enough in the sky to cast its rays through the sun porch’s southern window so that they fall, just so, on my couch. That's very cool. It is interesting to note how things change in our spaces as this world spins around. We live a block away from an elevated train track and at a certain time of year, at a certain time of day, when the train goes by it blocks the setting sun effectively darkening our whole house, just for an instant. The first time it happened we were startled until we realized what it was. Cats seem to find the sun spots as you did. Happy Friday to you. Sounds lovely. We haven't had much sun the past couple of weeks. I miss it. Me neither! Plus the sun hasn't been out!